COMPACT STUMP GRINDERS FOR LANDSCAPE WORK AND TREE REMOVAL. 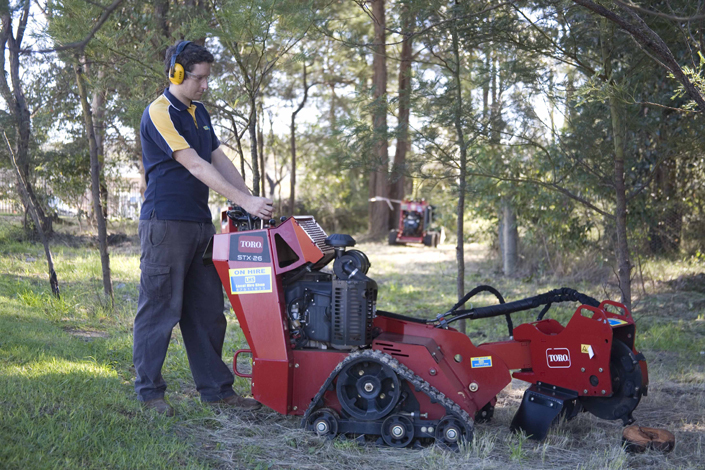 While many stump grinders may be complicated to operate, today’s dedicated compact Stump grinders are easy to operate . For example, the Toro STX Stump grinder is too simple levers that are easy to learn and master. When used with rubber tracks and speed that can exceed 3 km/h you get maximum productivity. Wet, hilly terrain won’t stop you from accessing tough jobs year-round and the machines low centre of gravity adds side hill stability. In addition, the hydraulically driven head means no chance of expensive belts breaking or slipping no adjusting tension – guaranteeing optimal performs time after time.